Maserati have had a chequered racing career and with it a love hate relationship with those who could and can afford them. They were founded in 1914 and from early days they were a force in their own right and in the post war Grand Prix era were dominant in the hands of the likes of Fangio, Nuvolari, Varzi, Villoresi, Sommer, Behra and Moss. Eventually they retired from competition officially in 1957. The sixties saw a lull in their motorsport participation. With the exception of the 12 cylinder engines supplied to Cooper and a victory in South Africa 1967, most other Maserati sport was in the hands of privateers. Victories were dotted over the calendar and they even featured in the watersport records. Maserati recently relaunched its Sporting participation with the introduction of the single series ‘Trofeo’ Championship and has kicked off into the FIA GT Championship Series with the MC12 very successfully, beating Ferrari into second place with several events in hand! 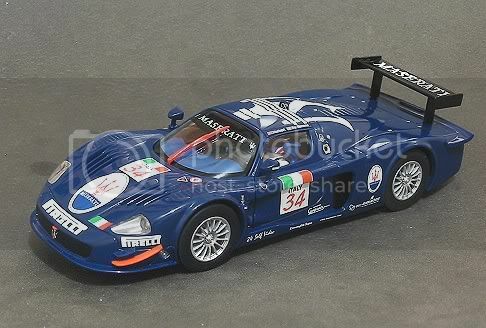 To say that the Maserati MC12 was not a small car would be an understatement. 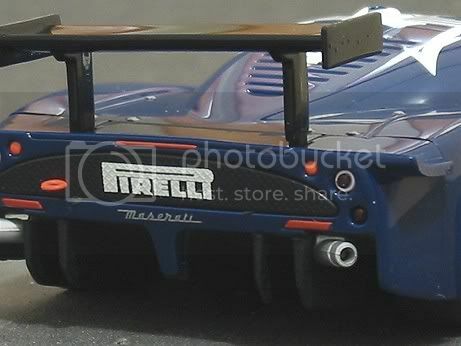 As far as slot cars go it ranks alongside the Aussie V8 Falcons and Holdens stretching to over 160 cm!! It’s no lightweight either, tipping the scales at 113 grams! And neither is it a “plain Jane”! As well as the huge Trident emblazoned across the roof the model carries a host of very finely tampoed sponsors. The Italian flag proudly displayed as part of the number decals and several leading Italian companies tastefully adorn the shiney blue exterior. Carrera have even faithfully reproduced detail down to the quick release fasteners which hold the engine cover/rear bodywork on! Even though there is only half an interior, detail on what there is is good. Wrap around head restraints on the drivers seat, sequential stick shift and a faithfully reproduced racing steering wheel in deep detail. The best part of the exterior features are the removable rear wing and door mirrors. A bone of contention STILL with some leading makes!! Underneath is much the same as other models but this time there are double braids on the rather large guide. Not every ones cup of tea but something I like to see. This model has a traction magnet slung between the motor and the rear axle. In the little spares holder on the back of the display case is a spare set of braids and a shim which fits nicely under the magnet for absolute traction!! The Carrera moveable magnet also lives here between the motor and the guide. The guide is the broad Carrera offering which looks a bit daunting but seems to work well on plastic tracks. My only complaint as with nearly all Carrera guides is that the guide has a lot of slop! Especially front to rear! As mentioned in a previous review Mr Carrera could well adopt the practice of popping a second smaller guide for us Scaley/SCX track runners in the little cubby house on the back of the box. A guide with a little less slop and a little less depth would be fine. 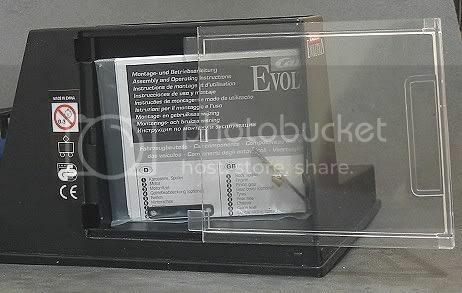 It is here that the Scalex and SCX systems of quick release guides have the upper hand. To date I have not yet felt disadvantaged compared to hardwired Ninco and Fly guides. Inside the model once again is the Carrera nerve centre! More wires than a transistor radio and still no reception! The reverse polarity switch is still part of the scene but I’ll put money on it that this will be history in a year or so! 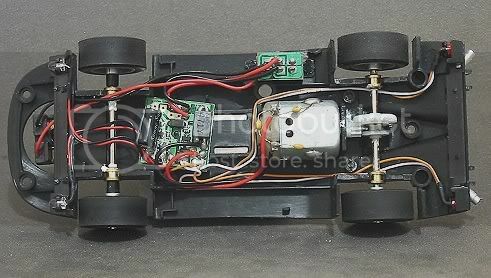 There is a circuit board that regulates the lights front and rear and the usual drive train paraphernalia. I noticed on this model that the rear light wires rub on the rear axle! A potential problem down the road? Who knows? The front and rear axles are well fitted and there is no necessity to shim them. Both axles also run fairly snugly in brass bushes. This model has a fixed front axle and therefore the body weight is shared between the axle and the braid tension. On Scalextric track which has the most prominent conductor rails you may find the model’s front wheels may not touch the track on some sections! I am still trying to get over the hugeness of the wheels and tyres. Lovely wheels, lovely tyres, but so huge!! Almost negates the Carrera move to a 3:1 Final drive ratio. I am thinking of trying a 28z or 29z crownwheel on this and other Carrera models but more of that later. I had the opportunity to run this on the Four Seasons SCC green lane before all else and conducted a three stage tuning program with results noted. We haven’t measured FSSCC track length yet but it must be at least 25 metres and a fast and flowing 25 metres too! SOOB was not earth shattering but it confirmed that even with a 3:1 final drive reduction, the massive rear wheels and excess model weight were going to take some overcoming! So pressing on and giving it a fair crack I did about 40 laps and came up with a best lap of 6.869 seconds. The main detractions from a good lap were the wind-up it seemed to endure under acceleration, barely reaching max speed before the end of a healthy straight, and the necessity to brake prematurely into even the fastest bends. It’s only plus was that with its movable magnet right back towards the motor, the cornering was almost on proverbial rails! So! This model has a lot of potential but the average track owner isn’t going to realise it! Next stage was a bit of chassis tuning. Not a lot of scope here as the car is quite long and the positive body mounts, without modification, give nothing away. I managed to get a bit of movement and set off for stage two. Well, after another forty laps stage two was as good as stage one and no faster. Never mind, SOOB must have been THAT good! Stage three permits the use of tyre cleaning and sanding. Although the tyres and wheels were very true, there was a little improvement. Tyres were cleaned with WD 40 and dried off and away we went. Cornering was once again first class with the magnet to the rear. Any suggestion of moving it forward caused the car to slide out in corners so back it was! Another forty laps and the best that could be managed was a 6.582! mainly due to its cornering. With GT1’s lapping in the 5.8’s this car was not going to be a contender yet I can’t help being struck by its shear size and weight. It is a very attractive model and is well finished. My conclusion! For small track magnet racing it requires yet more gear reduction. Maybe a 29 or30z crown wheel! But it’s not all over, Board track evaluation was the next step so down to my local board track with it (and a box full of other stuff) for an evenings entertainment, bearing in mind that the Carrera Audi A4 was VERY impressive on its maiden outing. The computer program used has a facility to enter sounds for various functions. There is a countdown and a start sound there is a sound for the end of the race and there is one allocated for fastest lap. The beauty of this is that you don’t have to try and keep one eye on the monitor to see how fast you are going. Each time you register a faster lap the allocated sound is played. In my case I have been to the Murray Walker site and downloaded the “WOW” file which plays each time you better your time. With red lane cleaned and run for an hour or so it was time to put the Maserati through its paces. As always, starting off at a steady pace it was instantly obvious that the tyres were going to need a fair bit of attention. The model tended to accelerate strongly but with plenty of wheel spin, putting in in a semi sideways position fot its trip down the straights. Corner entry too saw the model slew sideways into bends at about thirty degrees. Continuing with its SOOB test (The model had been reset since its plastic track outing), It was driven for another thirty or so laps. The tyres started to come good and the lap times came down to the low eights. And settled there. Last step was stage three and rear tyres were trued. One tyre needed very little treatment and was almost concentric from the start. The other had quite a severe moulding distortion and took a bit of truing. Care was taken not to give the tyres different diameters. The tyres were then cleaned and dried. As always, with this stage the difference was noticed immediately, corner speed was good and acceleration was instant. The model drove extremely well in all parts of the track. Corner entry speed was verging on the unbelievable ane the consequential exit speed gave it a good run at the straight. Lap after lap the times plummeted until the “Fastest Lap” sound became less frequent. After running for several laps more on the edge and still not bettering the time I stopped and looked up. This model had just finished a best lap of 7.093 secs. That placed it amongst the fastest models and beside its stable mate the Audi A4! Front Axle width			63.0 m.m. Rear Axle width				62 m.m. Rear Wheel Diameter			24.0 m.m. What can you say? A huge model with more than excess baggage can perform like this! I was truly impressed. I must add though that Red Lane offers a fast and flowing 21 metre lap. On smaller or more twisty home tracks I would expect it to be handicapped by weight and final drive ratio. I like this model and would dearly like to own one but with three Classic slot car releases imminent I will have to pass for now, Maybe I will revisit this huge hunk of slot car again? This model was kindly lent to me by Chris Deitrich of the South East Queensland based Four Seasons Slot Car Club.